VARIOUS PRICE POINTS to suit your budget! James R. Moder® / IMPACT Crystal offers its highest quality Chandeliers (-00), trimmed with 100% Brilliant Swarovski® crystals, manufactured in Austria. SPECTRA® CRYSTAL by Swarovski for James R. Moder® / IMPACT Crystal Chandeliers offers an alternate high quality Crystal trim at a lower price. These Crystal Chandeliers are trimmed with precisely cut and polished Crystal prisms that offer the high quality of Crystals by Swarovski at a price that reflects excellent value and a brand name. IMPERIAL Crystal trim (-22) for James R. Moder® / IMPACT Crystal Chandeliers is a popular Crystal choice which features a combination of high quality Crystal from some of the world’s finest sources: Schöler from Austria, Asfour from Egypt, various suppliers from Turkey, including REGAL hand-cut and polished Crystal, Murano Crystal, Optic Crystal, and Crystal from other worldwide sources. Our IMPERIAL Crystal is a combination of quality Crystal to achieve a superb look at an excellent price point. REGAL hand-cut and polished Crystal trim (-44) for James R. Moder® / IMPACT Crystal Chandeliersis produced by artisans in Europe and around the world. This Crystal Trim is popular for those authentic connoisseurs who appreciate fine hand-cutting and polishing craftsmanship. This and other Crystal, such as Rock Crystal, are available by special customer request. BUDGET Crystal trim (-33) for James R. Moder® / IMPACT Crystal Chandeliers is great value and is sometimes used on large projects for budgetary reasons. Available by special customer request. 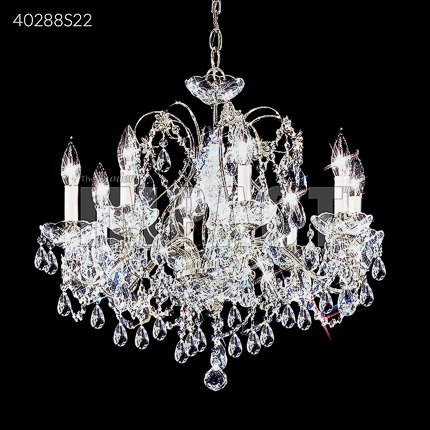 NOTE: This specific example (#40288) illustrates how the price of a Crystal Chandelier can vary greatly by changing the grade of the Crystal used to trim the Chandelier. The size and shape of the Crystal pendants may vary between different qualities and sources for the same style of Crystal Chandelier.